Why does this watch cost Rs 125,00,000? It’s made out of scraps from the Titanic, that’s why. The world of luxury watches is a rarified place. When faced with one, it is considered impolite to raise an eyebrow at the price, let alone gasp. Keeping a sense of perspective is crucial, especially when it is a watch partly made with steel from the hull of the Titanic, and costs $250,000 (approx.). Prince Albert of Monaco sure kept his composure when he got one. A limited collection of 2,012 watches, to commemorate the 100th anniversary of the disaster, Romaine Jerome’s Titanic DNA series is a sight to behold. The first of the lot, the Day & Night, a limited edition of nine pieces, was sold out within days of being unveiled. 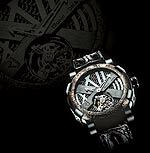 The Titanic DNA T-oxy III Tourbillon featured here is a limited series of nine as well. The good news is that there are still a few of them left. If you want to own a work of art that’s stunning, justifications are not necessary, but it helps to know that you’ll be a part of history. Coming soon from the DNA series, is a watch that can store information for 2 million years! And you thought cockroaches were resilient. • Movement: The unique RJ Tourbillon movement counters the effects of gravity by placing the escapement and balance wheel in a rotating cage.